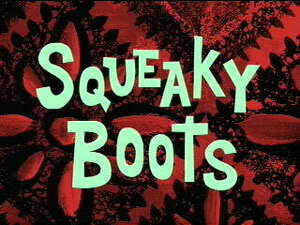 Squeaky Boots (Episode) – From SpongePedia, the biggest SpongeBob-wiki in the world! When SpongeBob was in Mr. Krabs' office and Mr. Krabs was giving the boots to SpongeBob and after he says, "These are my most expensive and most valuable possession I own." SpongeBob says, "Wow, really? Why is that? They just look like any other boots." "Why is that" isn't in the captions, they go right to the next sentence. When Mr. Krabs lets Pearl open her presents, the cake on the table disappears. When SpongeBob is demonstrating the talent he can do with the boots, he is the cashier and he asks the customer, with the boots, "Can I take your order?" "Can I take" isn't in the captions, so it says, "Your order?" After Mr. Krabs stole the boots, he went to the Krusty Krab. On his way both Patrick and Squidward's houses were not seen. This page was last modified on 30 April 2018, at 11:07.